Experiences in early childhood have a direct effect on both a child’s health and their health and well-being at later stages of life. Children who experience marginalization in these early years are at greater risk for lifelong health challenges, including irreversible negative impacts to their ongoing development. Addressing risks to a child’s developmental health at all levels of the social gradient, including strategies specifically designed for the most vulnerable children, is important for improving population health. 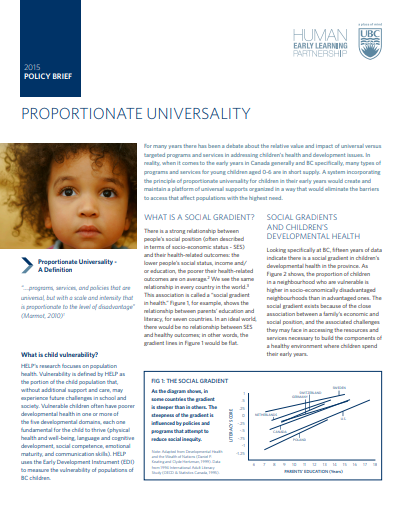 This policy brief provides an overview of the concepts of proportionate universality and the social gradient, the relationship of socioeconomic status to early childhood development and the importance of shifting the social gradient to improve child health outcomes. A brief discussion of the importance of including both universal and targeted strategies is included, as well as an example of what a proportionately universal family policy framework would look like. advocate for changes in program implementation towards a proportionate universal approach. Human Early Learning Partnership (HELP). (2015). Proportionate universality. University of British Columbia. Vancouver, BC.